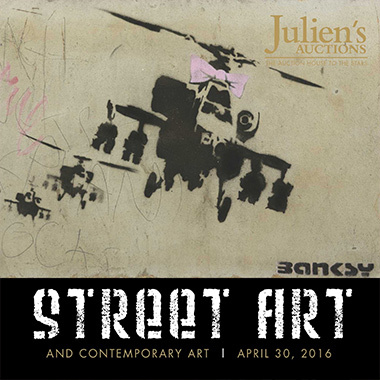 On Saturday, April 30th 2016, Julien’s Auctions will host its biannual Street Art and Contemporary Art auction featuring extraordinary highlights from the world’s most sought after street artists including anonymous graffiti artist Banksy, whose identity was recently revealed by scientists by using a modeling technique. The Banksy artwork collection is a featured highlight in the upcoming Street Art and Contemporary Art Auction taking place on Saturday, April 30th, 2016 at Julien’s Auctions Los Angeles gallery and will feature over 200 lots. The extraordinary Banksy artwork collection, estimated to sell for over $500,000, includes “Happy Choppers” (2002) (Estimate: $100,000-$150,000), an original aerosol stencil of armed military helicopters dressed with a pink bow created in London’s Whitecross Street Market; Banksy “I Heart Boys” (2005) (Estimate: $80,000-$120,000), a large-scale original mural depicting a boy playfully using a paint brush to paint a heart image on a now detached wall of a London residency; Banksy “Bomb Love” (2003) (Estimate: $25,000-$30,000) depicting a young girl hugging a bomb; Banksy “Nola” (2009) (Estimate: $25,000-30,000), a signed two-color hand pulled screen print of a girl holding an umbrella with the rain mysteriously falling from inside it, an image Banksy famously used in New Orleans after Hurricane Katrina; Banksy “Morons” (2006) (Estimate: $20,000-$25,000); a signed artist proof acquired directly from the artist; Banksy “Crazy Horse” (2013) (Estimate: $60,000-$80,000); stenciled car door installation in New York’s Lower East Side during his 2013 New York City month long residency; Banksy “Stop and Search” (2007) (Estimate: $8,000-$10,000); and Banksy “Toxic Mary” (2004) (Estimate: $4,000-$6,000). The auction will also feature a significant collection of over 30 works by the iconic street artist Shepard Fairey, including an HPM silkscreen and mixed media collage signed, dated and titled “Obey 95” (2005) (Estimate: $16,000-$18,000) as well as “Walk The Line” (2005) (Estimate: $25,000-35,000) an original work on canvas. Other highlights include an Invader “One Space” (2005) (Estimate: $35,000-45,000), a vintage pixelated Space Invader figure made of glass mosaic tiles, signed, titled and dated; a RETNA “El Salvador” (2014) (Estimate: $2,000-$4,000); a complete set of Damien Hirst Spin Paintings (Estimate: $3,000-$5,000 each); and artworks from a private collection direct from the renowned Los Angeles Street Art gallery LAB ART, which was responsible for launching the careers of some of Los Angeles’s most notorious street artists including Alec Monopoly, KAI, DOC, Gregory Siff, Mar and many others. The Street Art and Contemporary Art Auction at Julien’s Auctions will also include “The Modern Multiples Collection,” the preeminent fine art printmaking studio founded by Richard Durato (1952-2014), who ran the Los Angeles based venue for over 30 years, printing work for artists like Banksy. This collection features works which include Gregory Siff's “Goodface” (Estimate: $3,000-$5,000); Becca “Ride or Die” (Estimate: $3,000-$5,000); Pose “Rumble” (Estimate: $4,000-$6,000); and iconic prints created at the studio by artists Shepard Fairey, Ron English, Chaz Bojorquez, Futura and Saber. Contemporary works by Jeff Koons, Keith Haring, Yayoi Kusama, Andy Warhol, Basquiat, Robert Rauschenberg and influential urban artists such as Ben Eine, Rene Gagnon, Zevs, D*Face, Faile, Kaws, Ludo, Dolk, Saber, Nick Walker, Hush, Paul Insect and many more will also be highlighted in this premier auction event.